"Goodbye, Goodness is the rock n' roll Great Gatsby." 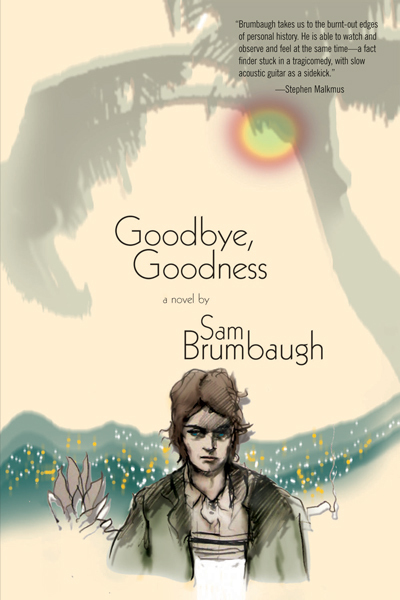 "Sam Brumbaugh's debut novel couldn't be more timely. Goodbye, Goodness boasts just enough sea air and action to make an appealing summer read without coming anywhere near fluffsville . . . Just as you find yourself engrossed in one [narrative thread], he switches to another, building a ferocious tension right up to the novel's bushwacking conclusion. "Sam Brumbaugh’s semiautobiographical Goodbye, Goodness has scenes set in Georgetown, Malibu, and the Wild West, but its real location is the whooshing vacuum left behind in the wake of failed American optimism . . . [the novel] beautifully captures the wrung-out feel of a depleted American century." "As the beautifully told story comes into focus, you begin to feel the relationships between the characters, each toiling at the edge of a frontier that’s been crossed a thousand times, each trying (with varying degrees of success) to live beyond loss and self-disillusionment." "The thrumming backdrop of Sam Brumbaugh’s well-wrought debut novel is the rueful American romance of the open road, combined with a near Ballardian Danse macabre of vehicles hurtling toward death clinches with each other." A brilliant debut novel about New York and Los Angeles in the nineties, Annie Oakley, and the end of the American Dream. Hayward Theiss is on the lam, hiding out in a Malibu beach house that is not his, and trying to understand how he got there. A car crash, a bag of dope, a sinister producer, and his best friend’s strange escape from rehab all figure into the story. To further complicate matters, Hayward is the great-grandson of a massively ambitious robber baron named Finn Theiss, who had a long-ago affair with the sharpshooter Annie Oakley. Hayward begins to untangle the convoluted estrangement between these two, and confronts the possibility that Annie Oakley is in fact his great-grandmother. The novel includes beautifully interwoven excerpts from Oakley’s autobiography that have never appeared in book form. Goodbye, Goodness is a simultaneously hopeful and bleakly realistic, hilarious, and devastatingly sad book about the American dream coming to the end of the line. Brumbaugh writes with the exquisite, nonchalant precision of a master chef preparing an early dinner for friends. Readers will be thrilled at the arrival of this new voice—and this new take on coming of age while fervently reckoning with the past. Sam Brumbaugh has worked in the music industry for two decades, touring with bands such as Pavement, Cat Power, and Mogwai, producing music specials for PBS, and, most recently, a documentary on the great Texas musician Townes Van Zandt (Be Here to Love Me). His fiction has been published in Open City magazine and The Southwest Review. A relative of Annie Oakley himself, he lives in New York City. Please direct all other inquiries to Joanna Yas, 212.625.9048, .